So I contacted email support about this, but haven't received a response in like a couple of weeks so I figured this is probably a better place to post. I.e. 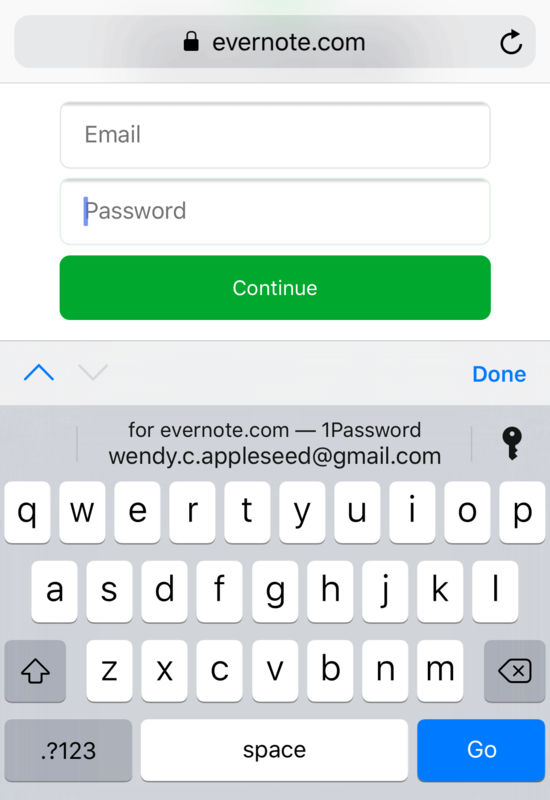 “for evernote – 1Password <email/username>” and you should just be able to click on it and it inputs it for you. However, I'm not using Safari, I'm using Chrome. I was wondering if this functionality could be made to work with Chrome as well? I really like this functionality but I really don't like other parts of Safari. I'm sorry we haven't responded to your email yet. I'm not seeing any open emails from you in our inbox. If you still haven't received a response could you please post the support ID you got back from BitBot here? I'd be happy to help you with this issue here via the forum. Password AutoFill is a feature of iOS 12. 1Password is one of the possible data providers for that feature, but we do not get a direct say in how it works in various parts of the OS / 3rd party apps. I will check with our development team to confirm, but I believe any improvement in this regard would have to come from Apple in the form of an iOS update.